Walmart does the community a wonderful service by employing tens of thousands of incompetents within the city. This is common for executives or people in higher position. If you mean the greeters, cashiers, etc...then yikes. When I volunteered at my local fire dept, I learned that I had a life insurance policy for $50k. I thought that was nice but wondered who paid for it. I was told that it was underwritten by some outside company that would get $100k if I died. Didn't seem so generous after that fact. No, it goes that far down the chain (or did at least). There was a story about that that hit the news cycle years ago. I saw a Dell Inspiron 3000 11" as well for $100 at a local store, but don't have the SKU. I believe it had an AMD CPU and 32GB EMMC for storage. Original price might have been $200-300 range. Could I ask for a bit of help? Walmart's website says there's six in stock of these (I don't know if this means six eight packs, or just six individual totes) at my local store, but there's no "add to cart" or "pickup" option, all it says is "price for in-store purchase." If I go there and tell them about this page, will that be enough to convince the workers to go look at the back for them? You can generate a UPC code and try to get an employee with a handheld scanner to try and locate it. And would that be enough to get them to help me? Sorry, the workers at my store just keep passing the buck to someone else until people leave. If they don't have a scanner, its understandable. If its not their department then ask if they can call someone to help you. If they are from that department, have a scanner, and still won't help you? Ask for their department manager. If the department manager isn't there, ask for a manager that can help you. Its up to you if you want to let the manager know how poorly you have been helped by the previous employee(s). Not clear if this includes the SD card adapter or not, but there's a 128GB SanDisk microSD card on sale for $27.98 in-store. I guess it's okay if want it right away but 128GB Sandisk and Samsung microSD cards go on sale on Amazon for like $20 or so all the time. Okay... guess I'm going on Sunday then. Fun experience with picking up the HP laptop i mentioned. I opened to find a completely different HP laptop inside. The box had no obvious signs that it had been opened before. No idea how that happened, but laptop showed obvious signs of use. It was like pulling teeth to get the store manager to give me a refund, which was as a gift card. Not sure if I'll take the gamble with buying a laptop from Walmart or if i do i will go to customer service and open it in front them to make sure it's the right item. I had the same issue with an inflatable. The one that was in the box was old and nasty and smelled heavily of smoke. The store was VERY resistant to swap it out, but they eventually did. I'm thinking of just opening everything at customer service in the future. FFXV Royal Edition with all DLC is $20 new at Gamestop and will likely drop at other places too. It doesn't have all dlc. No version of the game does or ever will since they canceled the rest of the dlc planned and just released one or 2 things after the royal edition iirc. The item doesn't show up when searching the store. I see the other ones, but not this color in particular. I tried searching for another one (Elf Green) and it only says "recommended location: indoor"
Uh okay. The point is that the Royal Edition has ALMOST all of the DLC, is only $5 more, and isn't YMMV. Try being helpful next time instead of contrary. Supposedly the only DLC the Royal Edition won't have is Episode Ardyn, but otherwise it is the most complete version. S-E really screwed the pooch on this game, sadly. Agreed that for game content, Royal edition makes more sense. Deluxe edition has the exclusive steelbook along with the Kingsglaive movie, but if one doesn't care about that, Royal edition is the one to get. I believe i saw that for $20 at Walmart as well. Update: They said the bins are for in-store use only, for whenever it rains and they have to catch leaks. Try being helpful next time. What's the name of the price checking app? I was just saying you could price check on the Walmart app. Looking forward to dealing with a store that told me the system "randomly adds games to the inventory" after they did inventory. Basically they went from 0 to 4 of a game, back down to 0, back up to 4, then over the past weeks down to 3 and now 2. If the items are "non-existant". Deleting and re-adding, then deleting by quantities of 1 is a really weird way to shrink out "non-existant" inventory. Finally seemed to have some luck at two different Walmarts. The less exciting one had Xenoblade Chronicles X for $9. But the other had bins! 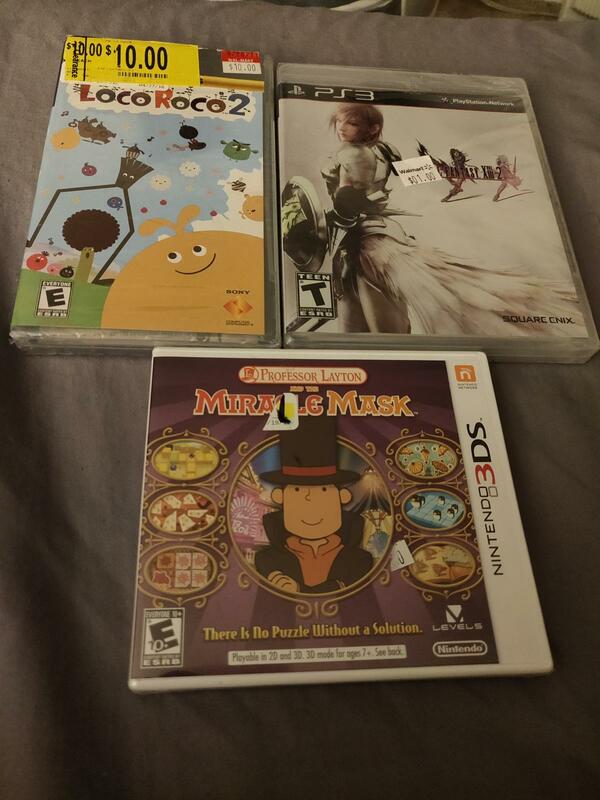 Some were marked absurdly high but walked away with this with FF being $1, Professor Layton $7, and Locoroco 2 $5.